Alright, so you've seen Alice in Sunderland listed in numerous "Best of 2007" lists, and you're thinking, "What's so bleedin' special about this dang book anyway?" Well, I've finished the copy I got for Christmas, and I'm here to give you the skinny. To start with, the book is NOT, as the title suggests, about the significance of Sunderland in the creation of Lewis Carroll's Alice books. Nor is it about Sunderland generally, or the Alice stories generally, or Lewis Carroll generally. Oh, don't get me wrong, there is PLENTY of information about all of that -- certainly more than in just about every other book specifically talking to any of those subjects -- but that's not what Alice in Sunderland is about. The book is about storytelling. Not just storytelling in comics and movies and novels, but storytelling in all its forms. How myths and legends begin, and how they evolve, and how they can be accepted as truth. The 300+ pages are crammed with information, much of which is only tangentally related to the "real" story. Matt K noted here a few days ago some agitation on his part with number of times Talbot pulled a "Six Degrees of Kevin Bacon" to provide something approaching relevance for what otherwise might cause readers to question its inclusion. Personally, I rather enjoyed that aspect, though largely because I've had an interest in Lewis Carroll for many years and those almost random-seeming tangents were the only new pieces of factual information for me. Talbot does do, I think, a very effective job in providing all of this information. There is so much, running on so many different levels, that trying to organize it all in a straightforward, logical manner for readers would be nearly impossible. Talbot seemed to recognize this and play that up with some decidedly non-linear storytelling. Which also works to the notion of following in Carroll's footsteps, and providing a sense of dreaming or something apart from reality. For those concerned, though, Talbot's language throughout the book is simple and easy-to-follow, which aids readers from getting too confused by the sidebars. What I found really striking throughout the book, though, was the art. He meshes typical comic book line drawings with scans of old artwork and photographs, as well as modified photographs to great effect. He also adopts various styles of illustration -- occasionally even getting other artists to assist him -- to emphasize differences in how the content should be interpreted. Likewise, there's no adherence to a strict layout; some pages have "traditional" comic book gutters between panels, others feel more like collage. Strangely, though, these different artistic approaches -- like the tangental content itself -- seem to largely blend together. While it's certainly noticeable when Talbot changes styles, it's not disruptive to the overall flow. It's clearest here, I think, that Talbot is a consummate storyteller and knows well how to work in the sequential art format. 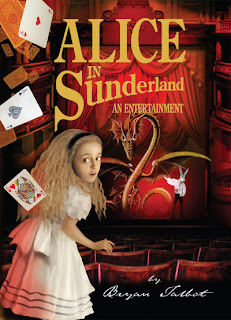 Alice in Sunderland does not have a typical plot, which would be easily explainable. It does not have a real protagonist or antagonist. There're no spandex-clad superheroes, no aliens, no superheroines with gravitationally-challenged breasts. It does have excellent storytelling, excellent artwork, a wealth of information, and a generally insightful message. Well worth the price of admission in my book. Heh, I wasn't agitated by the "six degrees" game, just a little bit bored. ;) It is a good book, though, and I've enjoyed picking it up and jumping in at various points, after my initial reading. One other thing, though, since you mention the artwork... I always enjoy Bryan's work, and I agree that the eclectic blend of layout techniques and image styles works pretty well. Oh, I can tell you precisely why Talbot did the filtering thing, because I ran into the exact same problem myself on a project some time back. He's dealing with photographs of all sorts of varying degrees of quality, many of which I expect he had to touch up and/or colorize. Running them all through the same Photoshop filter gives them a unified feel, so all those disparate images don't appear quite so different. What I did notice, though, was that he did seem to examine each photo individually and adjust the filter settings specifically to that image allowing details that might otherwise have been lost to be retained or even highlighted. It's not like he scanned all the photos and just ran them through a macro'd filter process blindly/automatically. Next time I flip through Alice in Sunderland I'll no doubt be looking more closely at every photo, thinking "hm, this one was probably really grainy..."